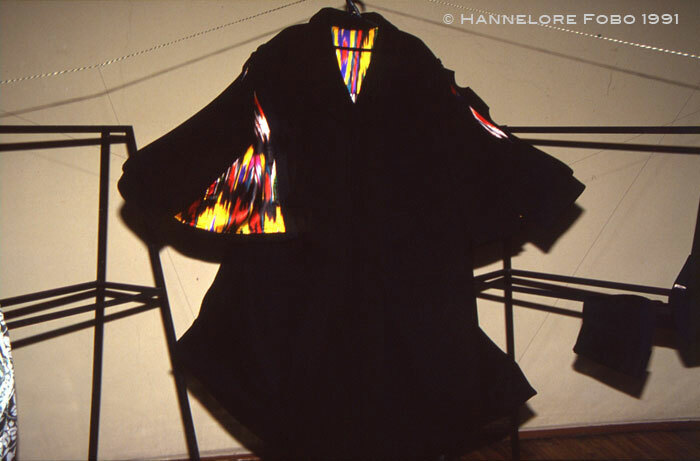 Photo documentation and text by Hannelore Fobo. Vladislav Mamyshev-Monro (Владислав Мамышев-Монро, artist and performer), Mikhail Trofimenkov (Михаил Трофименков, art and cinema critic), Olesya Turkina (Олеся Туркина, curator), Arkady Dragomoshenko (Аркадий Драгомощенко, poet), Viktor Mazin (Виктор Мазин, curator), Alexander Kan (Александр Кан, music critic), Larisa Gensler (Лариса Генслер, art collector), Bella Matveeva (Белла Матвеева, artist), Andrey Medvedev (Андрей Медведев, artist), Andrei Haas (DJ, Tanzpol), Gabriel Vorobyev (Габриэль Воробьев, actor and DJ), Timur Novikov (Тимур Новиков, artist and founder of “Neoacademism), Hannelore Fobo (curator and photographer), Nikita Kondrushenko (Никита Кондрушенко, fashion expert), Denis Egelsky (Денис Егельский artist), Ivan Movsesyan (Иван Мовсесян, curator), Yuris Lesnik (Юрис Лесник, film director, Pirate Television), Gleb Bogomolov (Глеб Богомолов, artist), Konstantin Goncharov (Константин Гончаров, fashion designer), Denis Neymand (Денис Нейманд, film director), Alexei Sokolov (Алексей Соколов, fashion designer), Alexander Nikolaev (Александр Николаев, artist), (E-E) Evgenij Kozlov ((E-E) Евгений Козлов, artist and film director). Russians use different systems when spelling their names with Latin letters (for instance for their Facebook pages), and I have tried to stick to their individual Latin spelling whenever possible. Variations concern, for instance, the transcription of soft (palatised) vowels “я” (ya) and “е” (ye). In the past, these y-sounds were often written with an additional y, as in Olesya or Movsesyan. Lately, it has become more frequent to use an i instead, therefore Olesia or Movsesian would also be possible. In the case of the e, the palatised sound is sometimes just omitted – Egelsky, not Yegelsky, Matveeva, not Matveyeva. Likewise, the endings ый or ий are often, but not always transcribed with a simple y – Arkady Dragomoshenko, but Evgenij Kozlov. This list of inconsistent transcriptions is by no means exhaustive, but the reader can look up the original Russian spelling added in brackets. 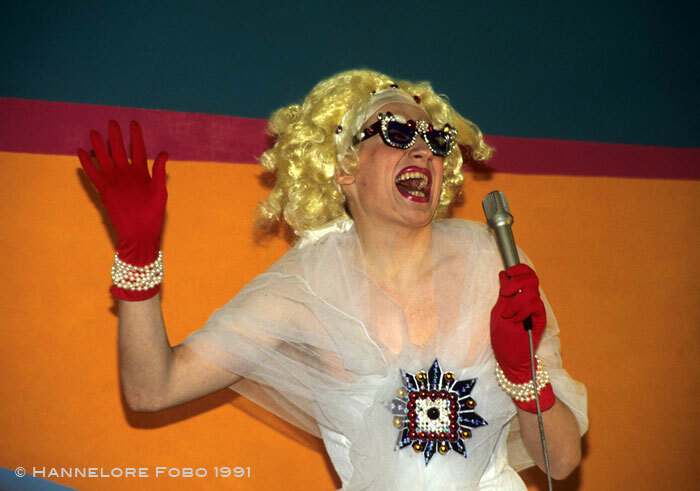 Unlike in my earlier texts, I decided to write Vladislav Mamyshev's artist name “Monro” – without the final "e”, although Mamyshev clearly referred to Marilyn Monroe. However, most English literature about Vladislav Mamyshev uses “Monro” instead. 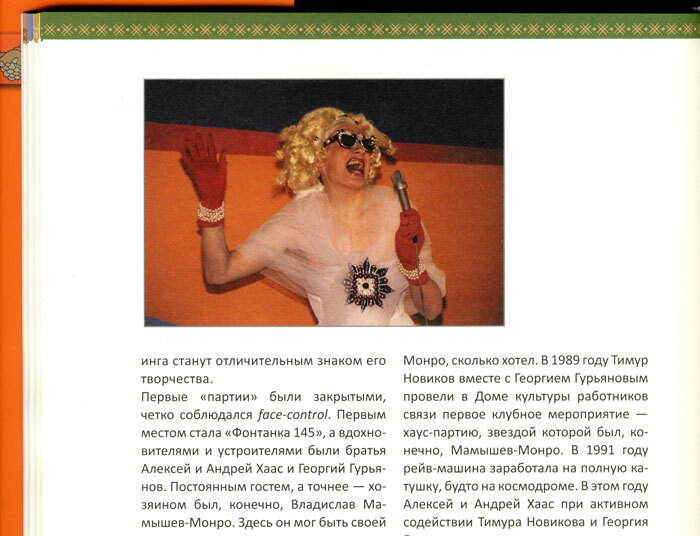 “Monro” is retranslated from Russian “Монро”: Владислав Мамышев-Монро. Russian sticks to phonetic transcriptions of foreign names, and therefore Монро is without the silent “e”. 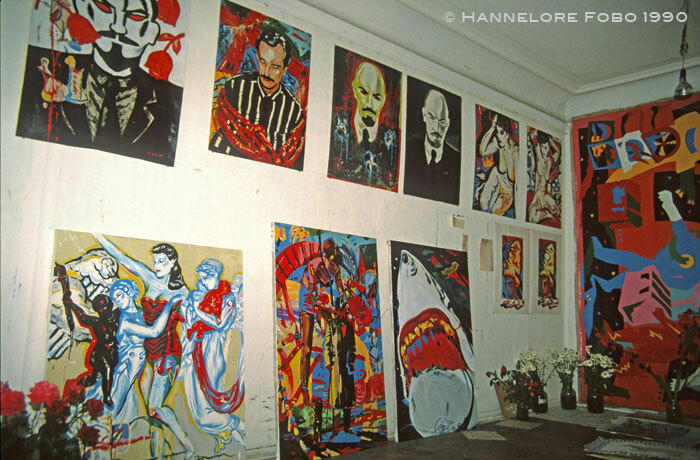 The shooting of Vladislav Mamyshev Monro's interview with Alexei Haas took place on 6 April, 1991, during the opening of the exhibition "Neoacademism" at the Marble Palace, Leningrad. At that time, the building was still known as the "Leningrad Branch of the Lenin Museum". A year later it became a branch of the Russian Museum. 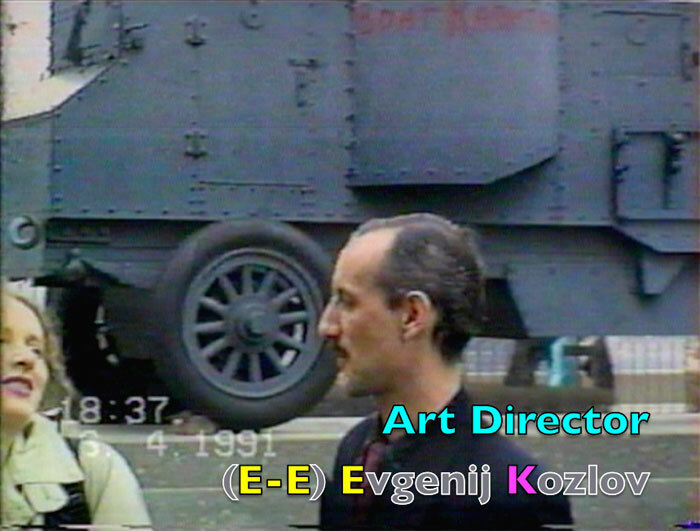 Accordingly, the last shot of the video offers a now historical view: (E-E) Evgenij Kozlov and I myself are seen in front of an armoured car installed at the museum courtyard in 1937. This armoured car became famous when Lenin, upon his return to Petrograd in April 1917, held a speech to his fellow Bolsheviks from the top of (most probably) this vehicle, calling for a Socialist revolution. Later the inscription “Враг капитализма” (The Enemy of Capitalism) was added. In 1992, the armoured car went to the Military-Historical Museum of Saint Petersburg. Now the monument to Alexander III from 1909 stands in its place. The spacious halls of the Marble Palace were a perfect location for the exhibition and Mamyshev's interview with Alexei Haas for “Pirate Television”. 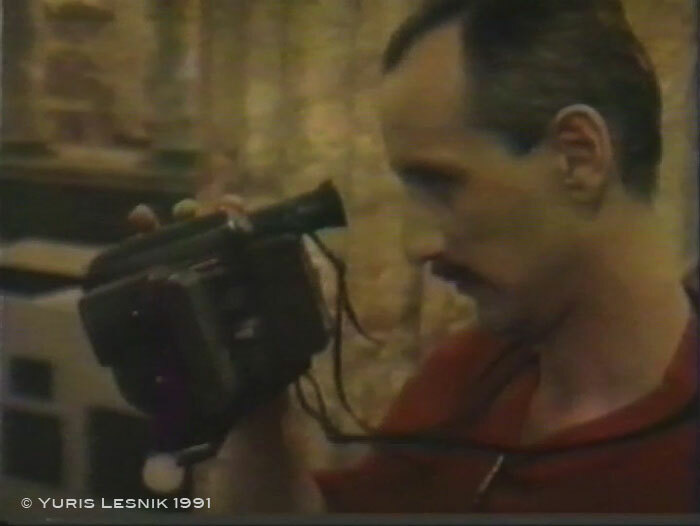 Kozlov filmed the double event with a Bauer C61 camera he had acquired in January 1991. It is a small VHS-C camera suitable for realising fast panning shots as well as zoom and strobe shooting – all characteristic of Kozlov's approach to filming. In this way, Kozlov was able to edit the video already in the process of recording it. I have therefore neither re-edited nor cut the footage. An exception are those short film stills of guests I created to insert name titles. For the sake of clarity I should add that Kozlov did not film on behalf of "Pirate Television", (the label created by Timur Novikov, Yuris Lesnik and Vladislav Mamyshev-Monro, see below), but for his own film production. Since 2009, we have been releasing these videos under the label "E-E films by Evgenij Kozlov" more>>. I would like to thank Andrey Khlobystin for helping me to identify several guests whose names were not familiar to me. As a matter of fact, the opening of “Neoacademism” was an important social event. 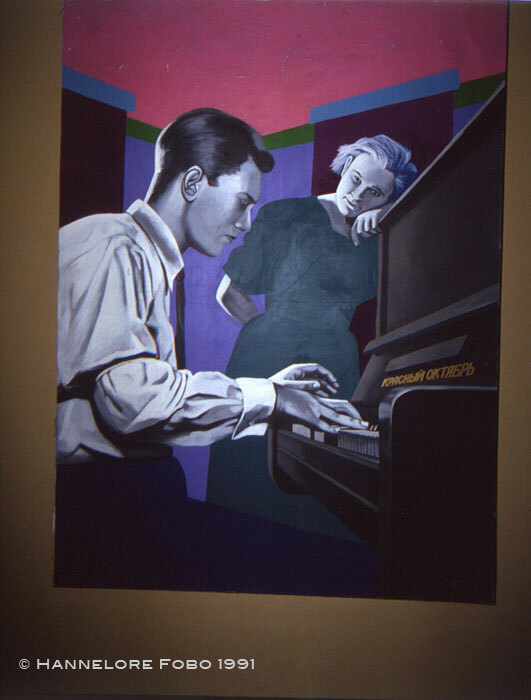 Many of those attending it were part of Leningrad's young art scene – as artists, fashion designers, curators, critics, DJs and party organizers. They often collaborated with each other or contributed to their friends’ projects. The house on Fontanka river embankment no 145 – Fontanka 145, in short – was the main hub for their activities. Since 1990, a techno and party scene gathered around Russia's first techno club “Tanzpol”, at Fontanka 145. “Tanzpol” was a private club run by Alexei and Andrey Haas (the Nearonov brothers) and Mikhail Vorontsov between 1990 and 1992 more>>. 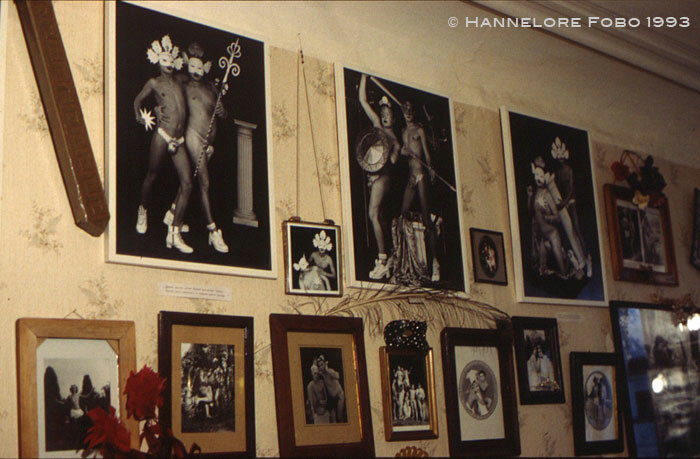 Kozlov, Novikov and Mamyshev were frequent guests at Tanzpol, and Kozlov had his studio "Russkoee Polee" (The Russian Field, 1989-1991) in the same building. 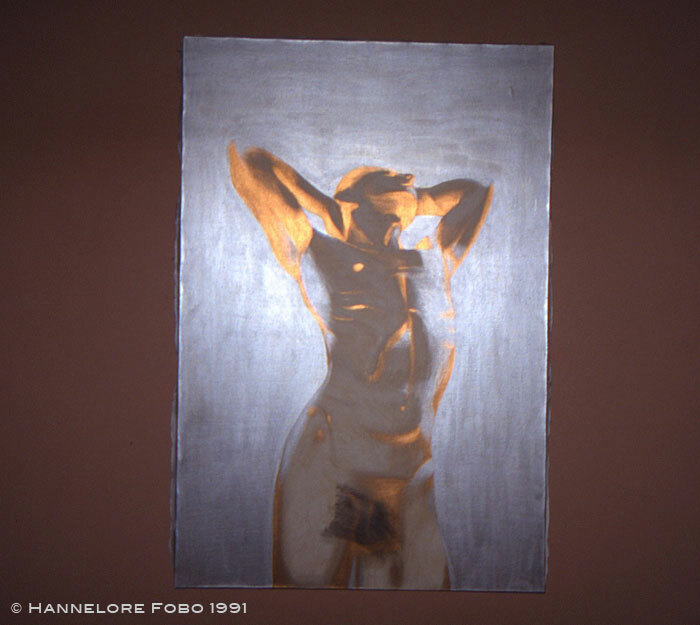 "Russkoee Polee" was also the venue for Andrius Venclova's video clip with Vladislav Mamyshev-Monro "Death of Monroe" (1991) more>>. Lesnik, Movsesyan and Guryanov shared the studio "Gold and Silver” – also called “Boys Club” –, located on the second floor of the building, below "Russkoee Polee", and Mamyshev would paint his paintings there more>>. The entire “Fontanka 145 crew” was involved in the large exhibition on Palace Bridge on 23 July, 1990 more>>. “Pirate Television” was a project by Timur Novikov (director), Yuris Lesnik (cameraman) and Vladislav Mamyshev-Monro (presenter); sometimes their friends would join them as actors. It was conceived as a sort of newsreel with Mamyshev presenting the latest news – made up by himself more>> – and society news, openings of exhibitions and the like more>>. In the catalogue "Self-identification. Positions in St. Peterburg Art from 1970 until Today“, edited by Kathrin Becker and Barbara Straka in 1995, Alla Mitrofanova dates “Pirate Television” to 1988-1992 (p. 184). However, when Mitrofanova refers to some other videos as being part of parallel cinema, such as Andrius Venclova's above-mentionend clip “Death of Monroe", music clips by the New Composer “and so on” (p. 185), we encounter a problem with defining the difference between "parallel cinema" and "Pirate Television". On the one hand, Mitrofanova explicitly mentions Novikov, Lesnik and Mamyshev as those who developed Pirate Television, whereas these "other" videos are given as examples of parallel cinema productions. On the other hand, these parallel cinema productions are described as characteristic of Pirate Television productions, which turns "parallel cinema" and "Pirate Television" into synonyms: "PTV has elements of a comic; of an anecdote, and it is characterized by simple form and linear action: the heroes are born, fall in love, marry betray others and die within 5-7 minutes.” But “parallel cinema” actually started in the mid-1980s with Evgeny Yufit's 16mm Necrorealist films, which are very different from the description given by Mitrofanova. Perhaps it might be argued that "Pirate Television" and "Parallel Cinema” share some common features during the last period of "parallel cinema” – the video period. However, with such a compromise, the original concept of “Pirate Television”, namely the concept of an alternative newscast, gets lost. To disambiguate the categories, it would be helpful to have a complete and detailed list of all “Pirate Television” videos, including information about when and where single episodes were broadcast. But it seems that to date no one has ever established such a list. In this way, the question whether Private Television should be regarded as a production company of three individuals or as a style fashionable at a certain period in time is left unanswered. Such a list would be particularly interesting with regard to the years 1988 and 1989. I am not at all certain that the collaboration between Novikov, Lesnik and Mamyshev started that early. What we can infer from Kozlov's video of “The DISCO PARTY Music Show” is that Pirate Television productions did not necessarily require the participation of all three founding members. This one had a different cameraman, a gentleman filming the performance with a professional Sony camera mounted on a tripod. We can see him in Kozlov's video. Yuris Lesnik is also present, but it is not clear whether he, too, recorded the performance. Incidentally, this "two plus one” definition would allow us to consider Kozlov's video as a Pirate Television production. Hence I myself would be a Pirate Television producer. I cannot say whether this "tower project" was indeed realised, but the “Tanzpol” team was in fact quite enterprising. 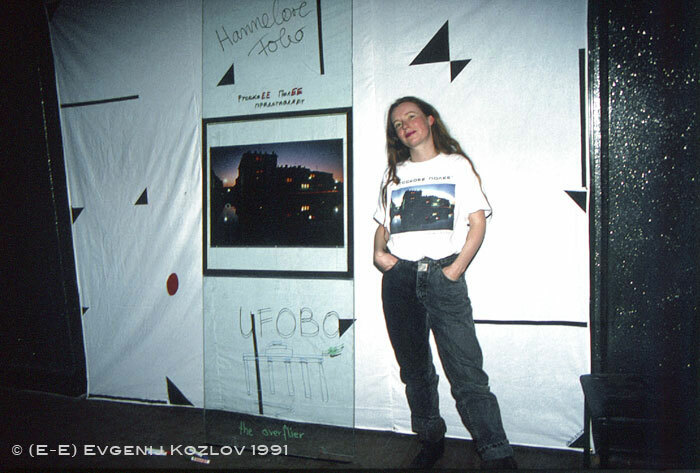 In December 1991, “Tanzpol” co-organized the legendary “Gagarin Party” at the “Cosmos” pavilion of the VDNKh, Moscow (ВДНХ – Выставка достижений народного хозяйства / Exhibition of Achievements of National Economy). Artist Andrey Medvedev, also present at the “Academism-Neoacademism” opening, designed the poster for “Gagarin Party”. Kozlov's video is also a movie about making a movie. It is interesting to watch Novikov and Mamyshev interact, for instance when Novikov suggests Mamyshev: “Maybe you should mention the name of the exhibition: At the Neoacademism exhibition”. Mamyshev turns Novikov's sober piece of information into an artful phrase “Our mikes are set up at the Marble Palace, at the Neoacademism exhibition”. Mamyshev's adds his standard phrase for the end shot: “This is all for today. You can write to us or give us a call. Good-bye!”, and then repeats with a slight variation: “Give us a call. Good-bye!” Here the phrase is without the traditional, ficticious telephone number - any combination consisting of ones, twos and threes, for example 223-332-2332 more>>. It would be nice to see the entire episode, if it ever came into existence. “Neoacademism" was the first major presentation of Timur Novikov's new brand, replacing his earlier brand “The New Artists”. The exhibition title varies according to sources. The catalogue "Neoacademism in Saint Petersburg” (Ekaterinenburg-Budapest 2015) refers to it as "Academism and Neoacademism" (p.162), while earlier catalogues and compilations, such as "Timur Novikov” (Saint Petersburg 2003), call it simply “Neoacademism” (p. 156). In the Pirate Television filming, Timur Novikov and Vladislav Mamyshev use only “Neoacademism”, and it therefore seems to be the original title. From those five artists presenting their works at the Marble Palace, Sergei Bugaev left the Neoacademism immediately, while others joined later. "Neoacademism in Saint Petersburg” lists a total of thirty-three artists. Kozlov, who had been a leading member of “The New Artists”, did not join the Neoacademists. 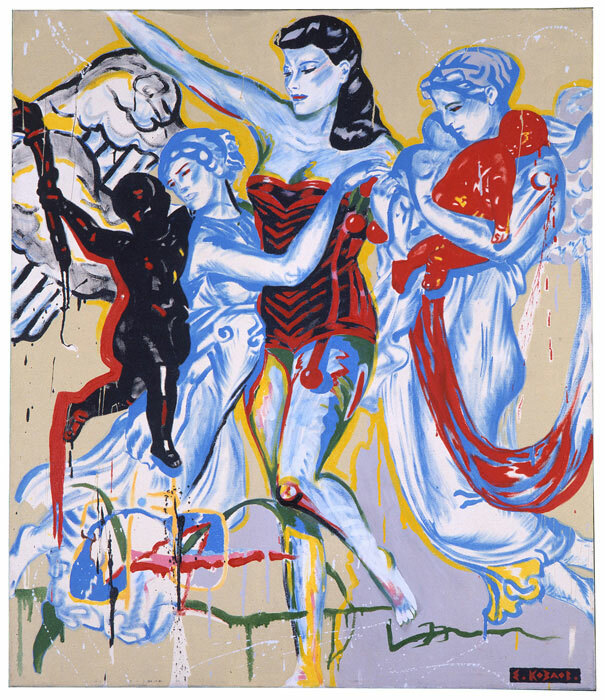 This might seem paradoxical, as his painting, according to art-historian Ekaterina Andreeva, influenced Novikov's new direction: “He [Timur Novikov] departed from ‘wildness’ under the influence of Kozlov’s strict style” (“The New Artists”. Moscow Museum of Modern Art, 2012, p. 44). New Academy of Fine Arts, Pushkinskaya 10 Art Centre, St. Petersburg, 1993. Top row: photos with Oleg Maslov and Viktor Kuznetsov. In 1993 Novikov received premises for “The New Academy of Fine Arts” at Pushinkskaya 10 art centre more>>. The picture above, which I took at “The New Academy” the same year, shows photos of Oleg Maslov and Viktor Kuznetsov. During their Neoacademist period, they worked as a duo and were unmistakably recognizable by their fanciful costumes more>>. 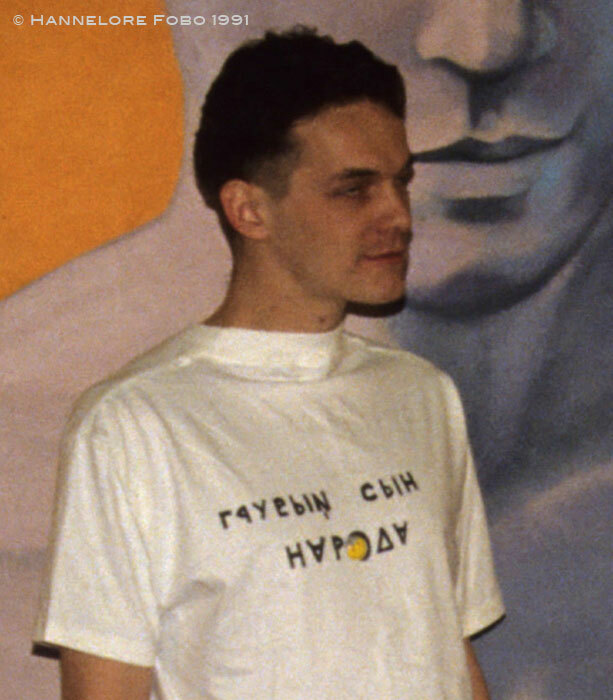 With Konstantin Goncharov and his label "Строгий юноша / Strict Youth“, later joined by Alexei Sokolov, fashion became an important component of Neoacademism. 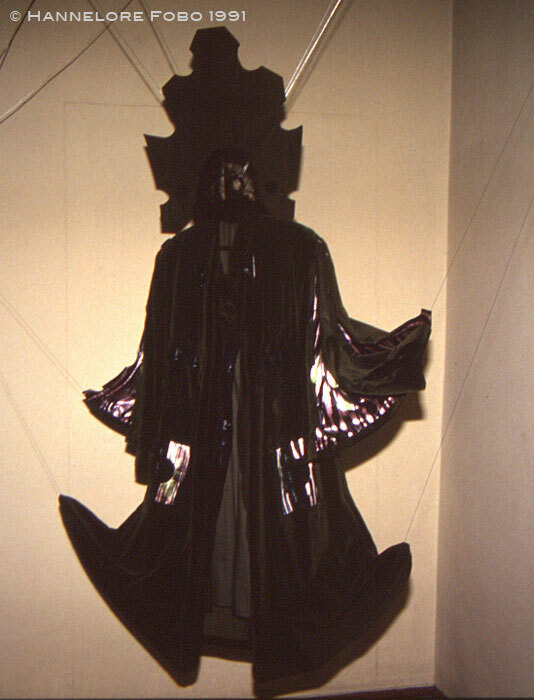 In 1994, Goncharov and Sokolov created costumes for a series of tableaux vivants based on Apuleius' “Metamorphoses”. 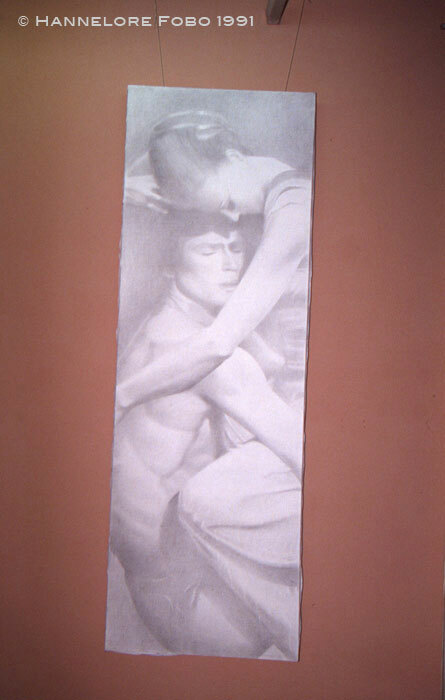 They were performed by Neoacademist artists and published in the book "Passiones Luci" (1995). 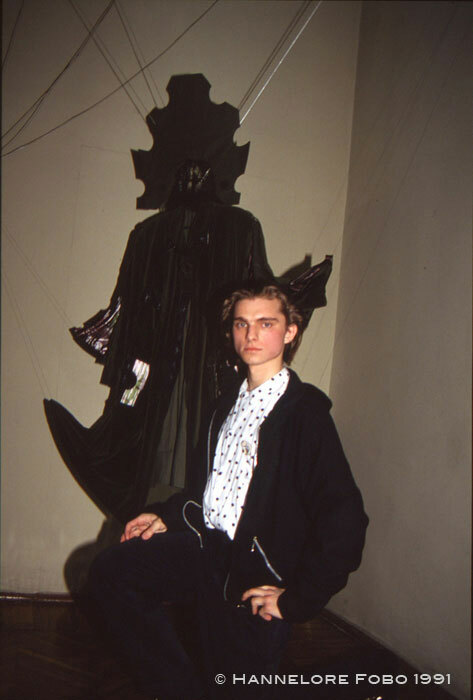 I started documenting Leningrad's young art scene when I first met Evgenij Kozlov in May 1990, at Fontanka 145, and he introduced me to his artist friends. In the video I can be seen operating my 35 mm Pentax camera. It was supplied with a large zoom lens and a powerful external flash gun, ideal for taking pictures from a distance, especially portraits, for which I used slide films. Some days before the opening of “Neoacademism”, on 30 March, 1991, I had presented large prints of these slides at the Leningrad Planetarium, a main venue for partygoers. In October 1991, my documentation of the exhibition "2x3m” on Palace Bridge, as well my portraits of Leningrad artists could be seen at the large Saint Petersburg Festival “Les Allumées” in Nantes, France. On this page are several of my pictures from the opening of "Academism-Neoacademism". 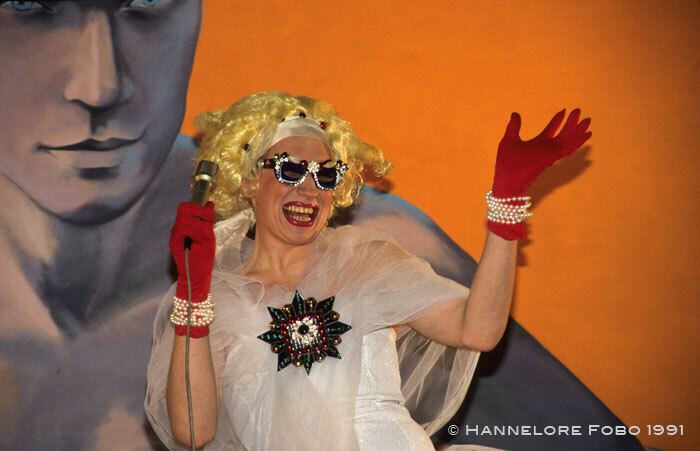 I particularly liked Mamyshev’s exuberant fashion style – his white semi-transparent lace dress, the red gloves, the platinum blond wig, bling jewellery, rhinestone glasses, and his strong make-up look –, set against the stark, contrasting colours of Guryanov’s self-portrait. "Pirate Television: 'The DISCO PARTY Music Show'”. 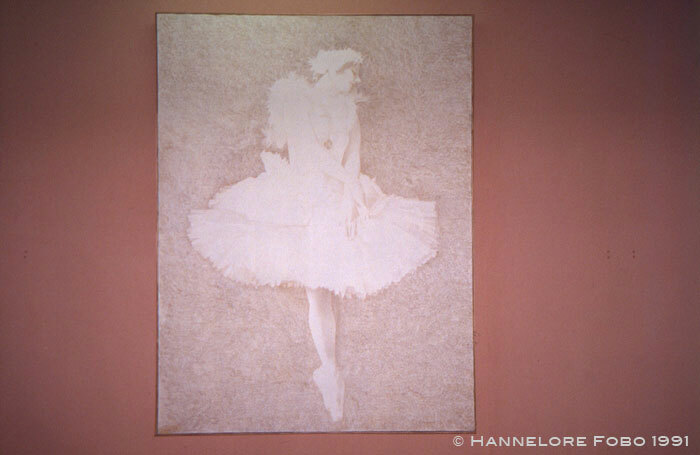 The picture was reprinted in the exhibition catalogue “Жизнь замeчательного Монро” (The Life of Remarkable Monro), Новый Музей (New Museum), Saint Petersburg 2014, edited by Olesya Turkina and Viktor Mazin. 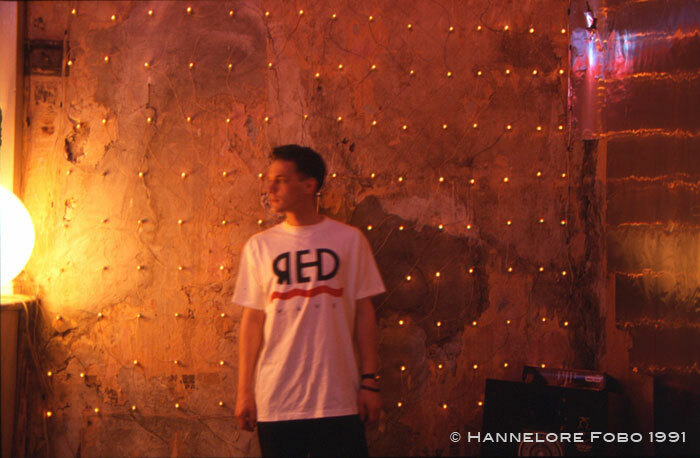 Alexei Haas'es simple white T-shirt with the hand-written inscription is also worth a second glance. Several Cyrillic letters are turned upside-down, but the word can be deciphered as ГРУБЫЙ СЫН НАРОДА, which translates as “A Rude Son of the People”. This is obviously an ironic or sarcastic comment on the honorific title “Great Son of the People”, or perhaps even on “Great Father of the Peoples”, an epithet associated with Stalin. I documented the exhibition with a selection of works by Georgy Guryanov, Konstantin Goncharov and Denis Egelsky. Timur Novikov's and Sergei Bugaev's exhibits are included in Kozlov's video. Hannelore Fobo, 19 February 2019.